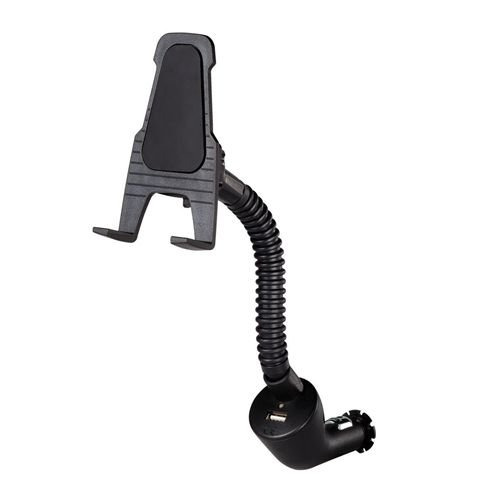 The CWA MNT110 UNI is a universal mobile device mount with a cigarette lighter plug with a 5 Volt USB output port that allows you to charge most cell phone and other mobile devices while they are in use and on the road. Universal Mount - Holds most portable devices. Device Viewable At Any Angle - Swivel and lock ball-and-socket armature. 6" Flexible Arm - Ideal for use in tight spots. Renewable Ever-Last Breakaway Adhesive - Secure hold of device on bracket. Dual Color Charge LED - Turns green when device is fully charged.